Ernest Hemingway: I think a woman is equal to a man in courage. Have you ever shot a charging lion? Ernest Hemingway: Would you like to know how that feels? Adriana: I don’t think so. Ernest Hemingway: You ever hunted? My first instinct regarding Woody Allen is similar to acid reflux. It’s a burn, that eventually dissipates, but hurts like hell for a moment. Seeing that he was not starring in Midnight in Paris was a plus, but no guarantee of success. Larry David was not nearly enough to save Whatever Works. Wilson, however, adds a sense of presence to the lyrical prose of Allen. It makes his words come alive in a way that Allen himself was not able to do for many years. This is one of the best showcases of both Wilson and Allen’s talents in each of their careers. Wilson is Gil Pender, a “hack” screenwriter attempting to write his first legitimate novel of prose. He is on a trip to Paris with his fiancé, Inez, overplayed by Rachel McAdams, and her Republican parents. This does not bode well for the pending nuptials, of course, as anyone with a conservative lean is pushed over into parody by the liberal Allen. Politics aside, though, since when has a Woody Allen protagonist ever liked the girl he is with by the beginning of the movie, much less, the end? Even worse, an old flame of the fiancé, a “pseudo-intellectual” played by Michael Sheen has shown up with his own wife. This means trips to fantastic scenery with annoying commentary, and Gil isn’t too interested in that. More interesting to Gil is this strange, new part of Paris that he finds after getting drunk one night, at the stroke of midnight. Here he finds what amounts to his “Golden Age,” Paris in the 1920’s. Here he meets all sorts of artistic types who say clever things and are always on the verge of creating their great works. The novelty is clever as it is convenient. Some of these past presences are entertaining to watch, like Bates’ Gurtrude Stein, Tom Hiddleston’s F. Scott Fitzgerald and, especially Corey Stoll’s manic impression of Hemingway. As good as Stoll is, and he is excellent, I had never pictured Hemingway as gregarious in the slightest. Seeing the contrast between Hemingway and Gil, however helps to more clearly give context to the character, making it much more realistic and clever. One of Allen’s recurring themes is infidelity, and here is no exception. His Gil is wandering, looking for a better time, when he literally stumbles into it, he gradually finds a beautiful woman, Adriana who opens his seemingly clueless mind to many wonders that women possess, even in his time. This set up does not go entirely the way I suspected prior to seeing the film, but anyone with open eyes, will clearly see where the destination. It is an interesting trip, to be sure, with some wonderful flights of fancy along the way, but the destination is always the same. 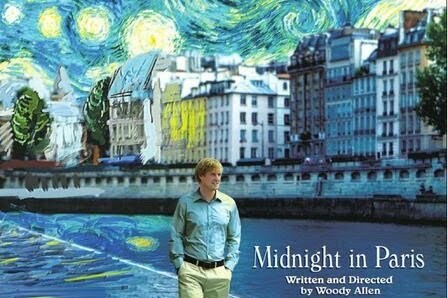 This movie is above average for Woody Allen fare, and would rate higher were it not for the fact that Allen makes the same type of movie most times out. His view of women, even at this late stage, is shockingly childish. Women in Woody Allen films come in 3 styles. First you have the witch, in this case, Inez. She likes to do whatever it is that the protagonist does not, and then berates him for it. Next, we have the waif. This is the woman, shown in many ways in this film, as the delightful, winsome and of course available. The third type of woman, and curiously, the only type free from his narrow judgement, are extras. As the protagonist, Owen Wilson gives one of the best performances of his career. His easygoing nature helps to mute some of the more egregious narcissistic tendencies of Allen’s prose, making it seem more real and less of a stretch. Allen had outgrown that age range where it seemed possible that young, beautiful women, with no self-esteem issues would be attracted to him. For people who enjoy Allen’s innocent portrayal of narcissism, as well those who would like a intriguing view of Paris in the 1920’s and beyond, this is a film you will enjoy. This is not the movie of the year by any stretch of the imagination, but it is not a waste of your time, either.